You have decided you want a greenhouse. Now, how do you go about deciding what you want? Do you want to purchase one of the greenhouse kits of would you prefer to build your own greenhouse? Here are some pluses and minuses of both choices. A lot of people will think that they can build their own greenhouse at a lower cost than buying a kit. That is not necessarily so. If you are buying a standard size kit with no modifications to it, you may be able to find this at a lower price than what it would cost you to assemble all of the materials you will need. Once you get into a customized unit that will probably change. 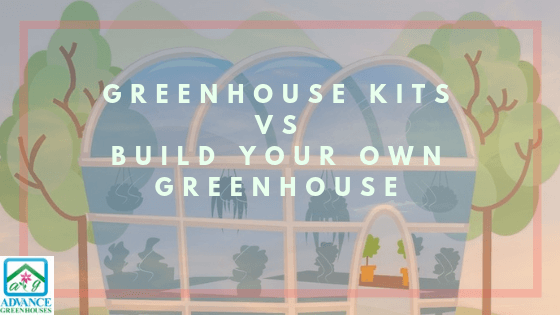 To customize a kit the cost would probably be higher than building your own greenhouse. Another reason you may be able to build your own greenhouse at a lower cost would be the fact that you are able to use recycled materials. This will help considerably with the cost. Hint: If you are using recycled windows make sure that they are tempered for safety reasons and to meet codes in most areas. Tempered glass will crinkle and not cut you if it gets broken. To identify tempered glass look in the corners of the glass pane. There will be an etched in tempered or temp in one of the corners. There are a lot of greenhouse kits which do not offer any changes or customization. These are typically the greenhouses that you will find in a box ready to ship. Greenhouses that are built for you typically take anywhere from 4 weeks on up. Since these are being built for you there are certain changes that can be made. The pitch of the roof can be changed. The standard sizes can be changed to custom sizes. You can change where the door is placed, etc. But, even though some of these changes are available they may not fit your needs. For example, most polycarbonate greenhouses can go down to a lower roof pitch of 2.5 on 12. But, for polycarbonate sheets you only need a 1 on 12 pitch to the roof. What that means is that for every foot the roof goes away from the peak, it must drop at least an inch. This may be more important with a lean to, attached model than with a freestanding greenhouse kit. I had a gentleman several years back who basically had the space a shape of a triangle. He built his own greenhouse using polycarbonate sheets and a wood frame to fit exactly into the spot. This would have been a very expensive option for a greenhouse kit. I am sure it would have pretty much been cost prohibitive. Depending on your local codes you may be required to supply stamped engineering to get a building permit. This is hard to find and costly if building your own greenhouse. Although sometimes with a polycarbonate greenhouse you can use the wind and snow load charts for permitting purposes. This is going to depend completely on your local codes and permitting office. If I was going this route I would be sure to check with my local office before starting the project. Usually greenhouse manufacturers that are building your greenhouse for you can supply you stamped engineering (from a engineer licensed in your state) for this purpose. It is harder to get stamped engineering with the greenhouses that are in a box and ready to ship. In fact, it is just about impossible. You may be able to access the materials you want to use, and then again you may not. The top choices for frames are aluminum, steel and wood. All of us can head out to the lumber yard and find the wood for the frame. But, if you want to use aluminum or steel will you be able to locate it? You may be able to find a local patio cover or sunroom company that will sell you aluminum extrusions. You may be able to use chain link tubing for a steel frame. Of course this is all going to vary according to your location. Pretty much all of the covering materials are available online and easily shipped. You can find greenhouse polyfilm and polycarbonate. The exception to this would be tempered glass. You may be able to find a local glass company that can supply you with this. Most glass companies have to order this in as they do not have the equipment to temper the glass onsite. As mentioned previously you should be using tempered glass for safety and code concerns. All manufactured greenhouses come with some type of warranty – some better than others. This should be checked out on a kit by kit basis. If you build your own some of the materials, such as polycarbonate, will have its own warranty. But, you will not be able to cover a greenhouse that you build yourself under warranty. This may be important to you, or it may not be important. Time can mean the amount of time to get the materials in or it can be the amount of time to actually build the greenhouse. If you are building your own greenhouse it will probably take you longer. A lot of the reason for this is the fact that you will have to cut all of the materials to size. In the greenhouse kits everything is precut to size already for you. But, if you are talking about the amount of time for you to get your materials, that is a different thing. If you are buying a greenhouse that is already boxed and ready to ship you should get it relatively quick. If you are purchasing a greenhouse kit that is built for you it will typically take 4 weeks or longer to get the kit. When buying glazing materials such as polyfilm or polycarbonate these can take anywhere from 1 – 3 weeks to get in depending on the current workload of the warehouse at the time of the order. Both of these have their pluses and minuses. You will just need to set your priorities and see which issue is the most important to you and your project. You may be toward the end of summer into early fall and need to get a greenhouse in place in a hurry. Or, budget may be your main issue. Whichever way you choose, don’t put it off. Your greenhouse will give you years of enjoyment.